I’ll admit, for the past 6 months or so, I’ve been a Google+ bigot. I was overly joyful at predicting Facebook’s demise and laughed at the types of posts that where popular there. I think I did this mostly because I was bitter. I was angry because I saw many bloggers having tons of success on Facebook, while I had none. I do still think Google+ is a better platform, but some recent insights I’ve gained about Facebook has me respecting and understanding it a whole lot more. In July of 2010, I created a Facebook Page for Side Income Blogging. I published my posts on it, tried to stir up some conversation and worked to engage my readers. I shared the Facebook page in articles, told my friends about it, and did everything I knew to do to grow that page. As of today, 3 years later, it has 156 likes. Only, 156. Needless to say, comparing myself to other sites on Facebook that have 20,000+ likes, I felt completely defeated. I had no idea what I was doing wrong, I felt like a complete Facebook failure. Of course the silver lining in this is that it caused me to look at other options, Google+ being one of those. I was an early adopter of Google+, joining in July of 2011, shortly after Google+ was announced. I played around with it for a bit, but made the mistake that many others made, and decided it was a Ghost Town. I went back to focusing on my Facebook page. Fortunately, in January of 2013, Google+ announced Google+ Communities. Communities intrigued me, so I decided to give Google+ another shot, and I’m glad I did. I noticed something about Google+ almost right away once I started actively engaging – The type of discussion and people where different than Facebook, way different. Many of the people on Google+ where technology people that ran their own blogs and websites. The people on Google+ seemed to be much like me. I wondered if Side Income Blogging could be more successful on Google+ than on Facebook. I created a Side Income Blogging page, and started working towards establishing myself as a blogging authority. This decision paid off. Eight months later, I now have more than 2,500 followers on Google+, and my Side Income Blogging page has more than 500 +1s and 279 people have the Side Income Blogging page in their circles. Far more successful wouldn’t you say? I feel very strongly that Google+ is critical for blogging success going forward. My wife and I had been tossing around the idea of starting a “Life” blog for some time. Last Sunday, we decided to pull the trigger. We created a blog called Blue Ridge Mountain Life that shares stories, photos, recipes, reviews, and news items about our life in the NC Mountains. Given the success I had seen a few other “Life” blogs have on Facebook, and in particular my friend Charles Keys with his Back Roads Living site and Facebook page, I decided to give Facebook another try. I expected similar results, but figured in couldn’t hurt. A week later, and the Blue Ridge Mountain Life Facebook page has over 500 Likes and has reached more than 72,000 people! I was shocked and thrilled. Our new site and Facebook page has been a huge success so far. I’m also seeing that the click through rate to our blog is pretty high, and Facebook users even click on ads. Blue Ridge Mountain Life is already earning income in it’s first week. I’ve never had a blog do that before. This had me thinking though: Why the big difference in success from Side Income Blogging and Blue Ridge Mountain Life? Why was one so much more popular than the other on Facebook? I remembered the articles I had read and frankly the advice I had given others: be where your audience is. Now granted, I’m over generalizing a bit, but the essence of what I’m saying is true. People visit Facebook to catch up with their friends and family and be entertained. As much as I would like it to be, Side Income Blogging just isn’t entertaining (even with grumpy cat images). The audience on Google+ is there to share knowledge and gain knowledge. While entertainment is a factor, I don’t see it as the primary factor. People on Google+ want to learn, they are there to expand their minds, their circles of knowledge and engage with like minded people. As a result, Side Income Blogging was far more successful on Google+. The type of people that want to see and read Carolina Mountain Life content are primarily on Facebook. The type of people that want to read Side Income Blogging content are on Google+. This whole concept is SO profoundly simple, that I’m still kicking myself for not seeing it sooner. I failed to go where my audience was, even thought I knew better. Once I did, I found success. The type and style of content you’ll provide on your blog. What type of people will be interested in that topic? What type of content will those readers get the most benefit from? What type of content will those readers enjoy the most? What social media platform those readers reside on. I would strongly advise that you do this before you start your blog, or at the very least very soon after you’ve started it. Failing to do so can result in a great deal of wasted time. Trust me, I know this fist hand. I spent so much time trying to make Side Income Blogging successful on Facebook. In hindsight, I should have targeted Twitter and Google+ instead. Fortunately, I got it right with Blue Ridge Mountain Life, and while I’m sure BRML can be successful on Twitter and Google+, I think the large majority of CML content consumers (my audience) are on Facebook and thus that is where I will focus my BRML efforts. For this blog, I’ll continue to focus on Google+. I’m going where my audience is. How about you? Where is your audience? 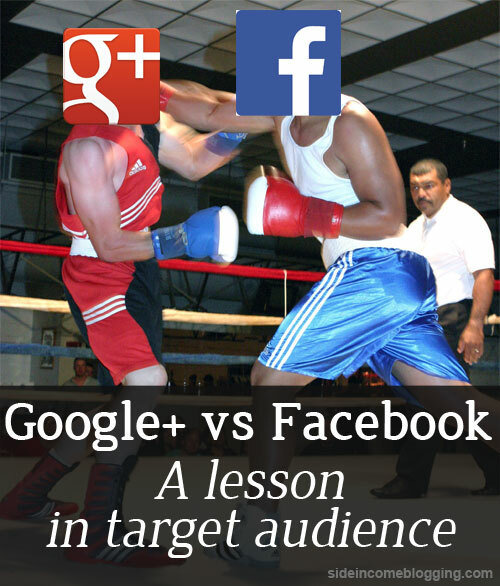 What insights do you have about Facebook and Google+ ? Nice writing. I also realize that the users on Facebook and Google+ are two different animals. I’ve started testing a niche page on Facebook and Google+. I should be able to see how it goes on both site. I think I will have a great success on Facebook then on Google+ for my niche. Keep it up! 20+ fans on Facebook is a great starting point. Good post. 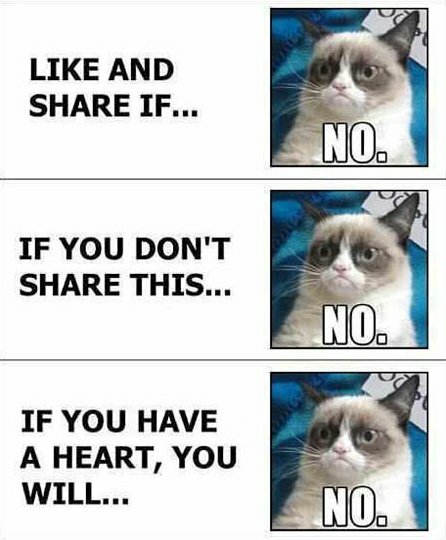 I know FB is a necessary evil, but I don’t have to like it. Im sticking with G+. I think having 500 likes is great, but there is little engagement on FB in my experience, whereas G+ people are paying attention. I much prefer to spend my time on people who will reciprocate. Ditto on Adam’s comment. What I got out of this article is that G+ users are intelligent people who are trying to expand their knowledge base and FB users are mindless [fools] who just want to be entertained. I prefer to spend more of my time with the former. That being said – you have helped me realize how I probably should pay more attention to FB for some of my sites/niches. Thanks for the insights Larry. I have a similar story with my business and pages. I own a credit repair and counseling company, and I have had tons more connections and interaction on G+ because I joined communities in which folks are interested in credit and finance. On Facebook, ha!, only the ones who need credit and debt help find it interesting, otherwise, its boring compared to pics of my kids or a quote, etc. You hit the nail on the head. Go where your audience is. Very helpful article. You confirmed what I noticed a little while ago: FB is for entertainment and G+ for more thought provoking, industry focused discussion. Thanks to giving credibility to what I once thought was some off stereotype in my head. Glad to hear it Shana, and I’ve been hearing similar things from other people over on Google+ as well. Hey Blair, I saw something very similar with the personal finance site I used to own. People in general, just don’t find finances very exciting. Matthew – I agree, that about sums it up. I think the thing to keep in mind is that both types can be beneficial, and sometimes “mindless” can earn you more income. Adam – I don’t like it either, but I’m not going to walk away from traffic or money. I also agree there is little engagement, but frankly I’m not looking for that on FB, I’m just looking for traffic and frankly ad clicks. I’m already earning more from my new site via Adsense than I am from Side income Blogging, and that is only from FB traffic. Excellent topic!! I find my audience prefer keeping entertained and in touch with me on Facebook – oppose to my Blog. They’ll read my blog post and go on facebook to comment / chat about it with everyone their. It’s seems that they like to see who comments on their response etc., and I’m always interacting with them as well. Each week I do a blurb about a post with a link to my blog – thinking that they’ll leave comment on the blog (sometimes they do), but for the most they end up on FB to communicate. Wonderful audience though, either way – I’m just happy I have them.